The bulk of the woodwork on CR buildings was painted in a brownish yellow shade known rather fetchingly as 'Duck's Foot'.....this was used for the planking, canopy valencing etc. The framing, doors, metalwork etc. 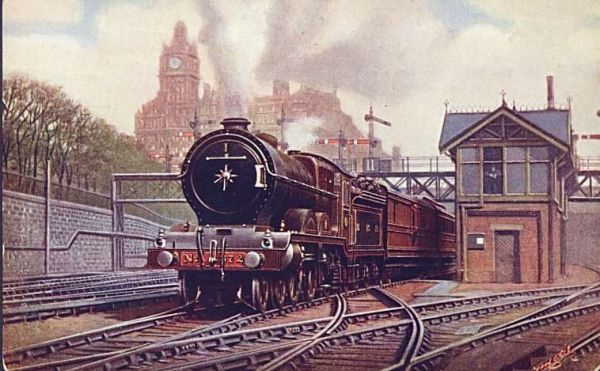 were painted in purple brown, which was much more of a brown shade than a purple and in fact seems to have been very similar to LMS buildings brown. Window frames were white. The inside & underside of station canopies was painted cream, no doubt to give as much light as possible. 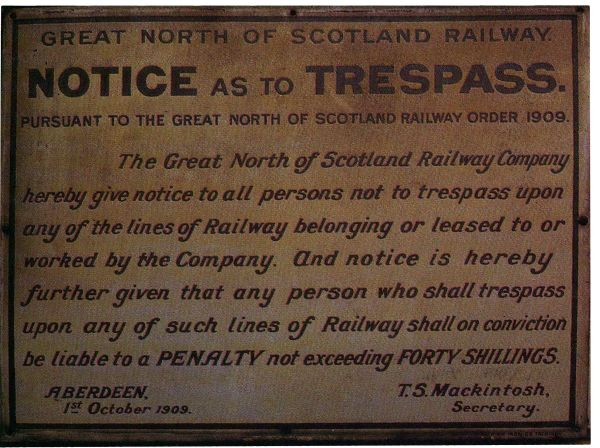 Station nameboards & other notice boards were blue with white lettering, while poster boards were painted black with white lettering showing 'CALEDONIAN RAILWAY' in full....an unrestored board recently came up at auction which finally confirms this colour scheme. Some enamel signs were white with blue lettering; happily this should be clear from a B&W photograph. Jim MacIntosh of the CR Association has given me a copy of the letter reproduced below which refers to the colours as 'Cinnamon' & 'Burnt Umber', but presumably these are alternative names for Ducks Foot & Purple Brown and might well give a better description of the actual colour. Station interiors are thought to have been light stone with a brown dado, brown doors & white ceilings. PAINTS FOR MODELLERS: Ducks Foot/Cinnmaon Precision P89 SR buildings dark stone Purple brown/Burnt Umber - Precision P43 LMS buildings brown with a touch of blue added. Precision CR coach purple brown could be used, but would need a coat of Matt varnish. Cream - Precision P95 SR buildings cream. 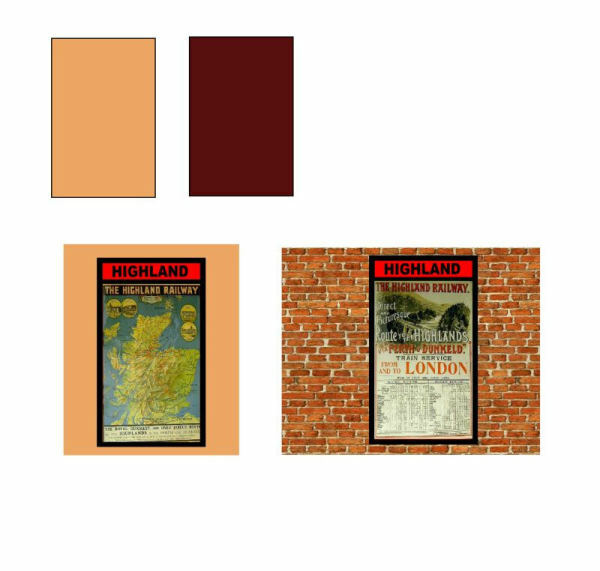 The Highland used a colour described as 'Burnt Sienna'; the nearest colour match I can find for this is LSWR salmon! 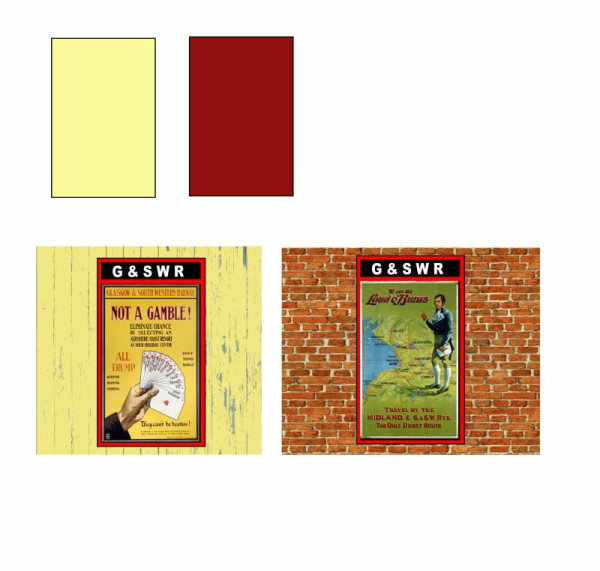 This colour was used on all public buildings including signal boxes, and on stations was complemented by a purple brown used for doors, framing, metalwork etc. Window frames could be white or purple brown. The purple brown was achieved by mixing black with the Burnt Sienna. 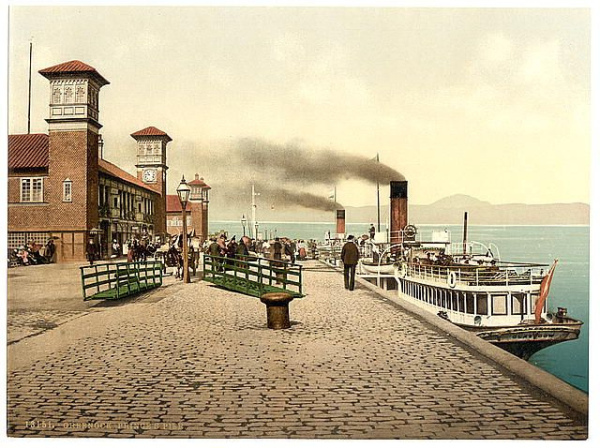 An article by H. S. Orbach in the March 1976 Railway Modeller suggests that after 1912 the lower three feet of wooden walls was painted in purple brown, with the upper parts in 'stone', a pale buff colour. The only parts remaining in Burnt Sienna were the brackets & beams supporting a canopy. Goods sheds, loco sheds & the like were not painted but creosoted, while any corrugated iron roofs were painted red oxide. 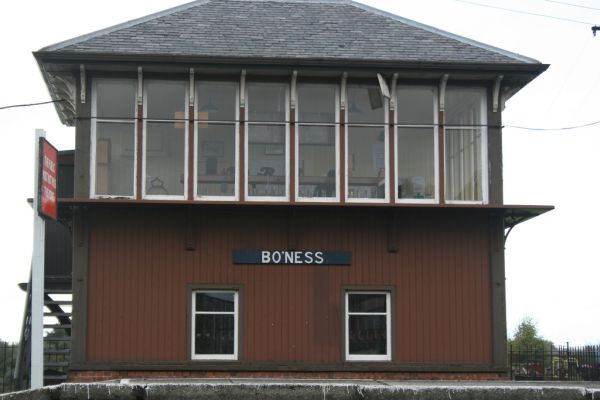 Station signs were painted white with the lettering & beading in chocolate brown, or sometimes chocolate with white lettering & this included signal box nameboards. Poster and timetable boards, however, were painted bright red with the beading & the lettering in black. There has been mention of a two tone stone/purple brown livery, but it seems that this was actually the LMS colour scheme being introduced after 1923, not a Highland livery..
PAINTS FOR THE MODELLER: Burnt Sienna - Precision LSWR coach salmon. Purple brown - Tamiya Hull Red. Many thanks to Ray Nolton and Darwin Smith for providing this information. For further details, see 'HIGHLAND RAILWAY LIVERIES' HMRS. 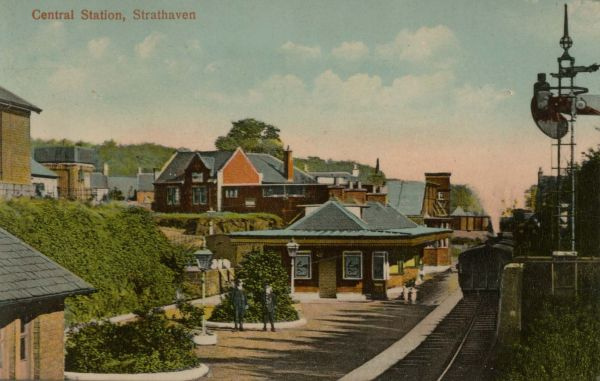 The Highland station at Boat of Garten appears to be in GNoS or possibly LMS colours, but it's the only picture I can find of a Highland station. Postcards seem to be non existant. 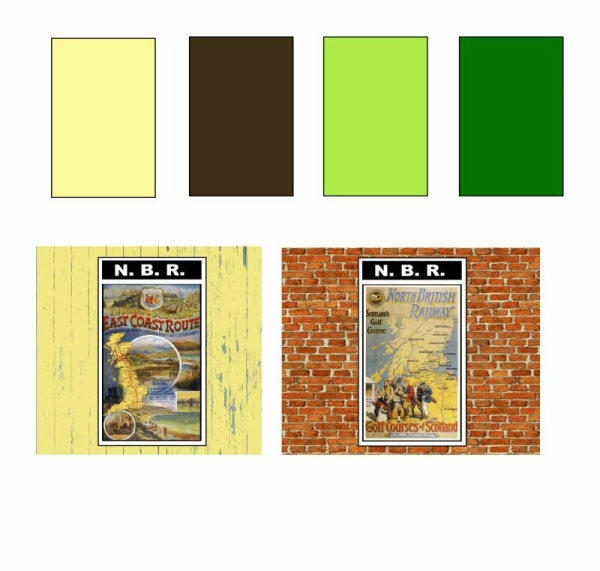 The NBR had two colour schemes for buildings; they could be painted in two shades of green, the lighter for planking, valencing, etc, and a darker shade for metalwork, doors etc. As an alternative cream and brown were used together; in both cases, window frames were white. Ironwork is recorded as being black, but I am nor sure to which Ironwork this refers. I have a feeling that the two tone green was the later livery used for instance on the West Highland line, but I have no written evidence for this. 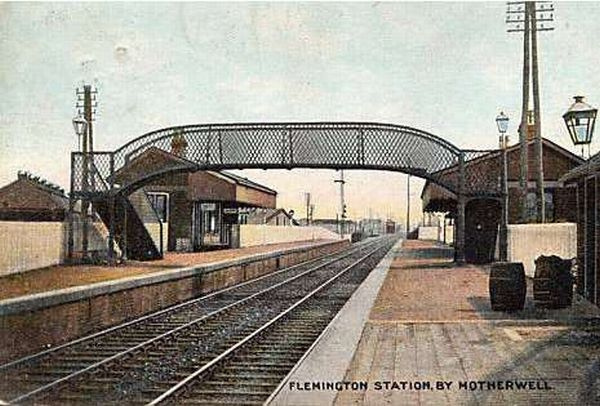 Station seats were black, grey or white with gold or yellow lettering identifying the station. 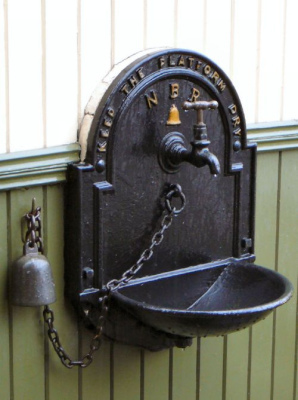 Platform barrows were vermillion with black ironwork. Presumably poster boards were painted either brown or in the darker green shade. PAINTS FOR MODELLERS: Cream - Precision SR buildings cream. Brown - Precision LMS buildings brown. Light green - Tamiya Yellow Green Dark green - Tamiya Park Green. Many thanks to Archie Noble for much of this information. 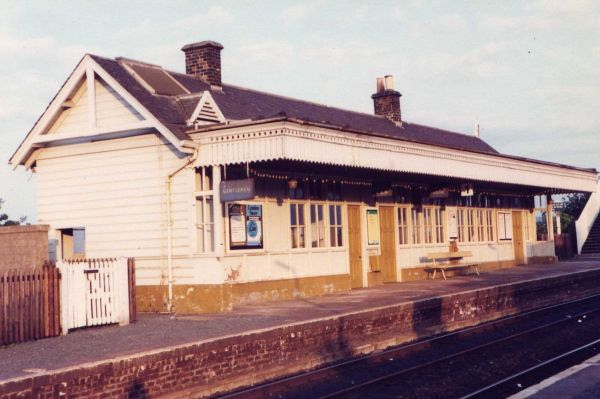 The station at North Queensferry in 1982, giving a very fair impression of how the NBR cream and brown would have looked. 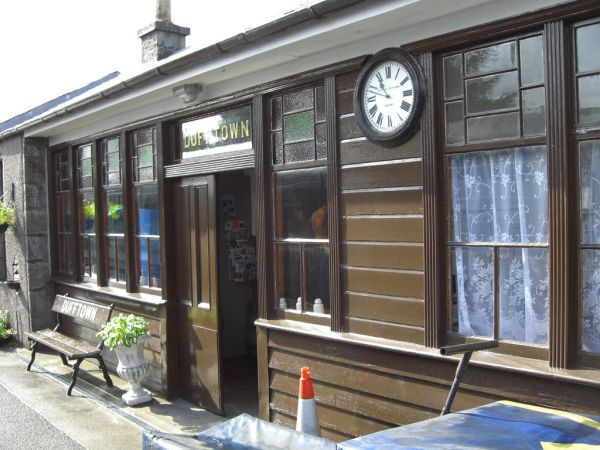 The whole of the woodwork was painted in a reddish brown colour; on some stations window frames were also brown, on others they seem to have been white. Drainpipes & guttering were painted dark brown. The reddish brownn faded with time & exposure. 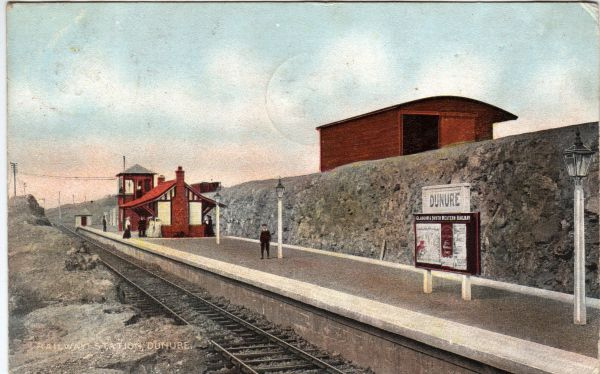 The light railways built in 1906 had a pale cream & brown colour scheme for the station building itself, though the signal boxes & other buildings remained in all over brown; Mauchline station (1904) may have introduced this alteration. 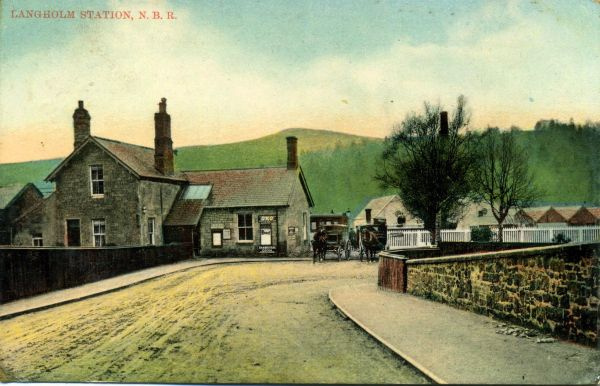 This lasted until 1920 when some stations were painted green & cream. Corruagted iron roofs were painted red oxide. The reddish brown would fade to a pinkish shade after long exposure to the elements. Poster boards were black with the beading in red & the lettering in white. Station nameboards were white with black lettering and station signs were white lettering on dark blue. PAINTS FOR THE MODELLER: Reddish brown - Tamiya red brown. Cream - Precision SR buildings cream. Many thanks to Stuart Rankin and John Stewart Clinton for the information. 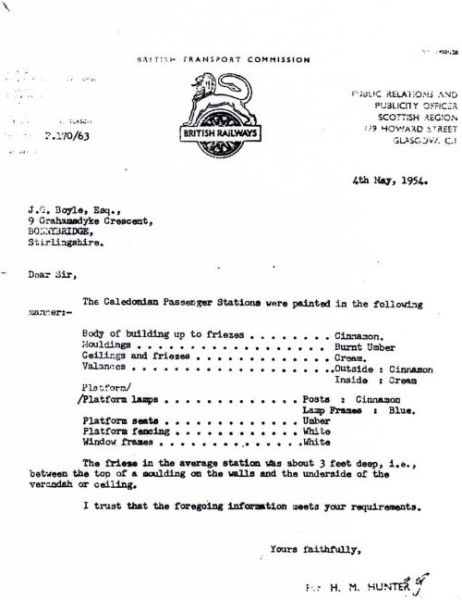 All the information on the GNoSR has been gleaned from black & white photographs and a paint sample taken from a pillar at Ballatar station; no official written specification is known to exist. A light colour was used for planking, etc, which is thought to be a cream, with a darker colour thought to be brown for doors, ironwork etc...... the paint sample taken from the pillar was brown. 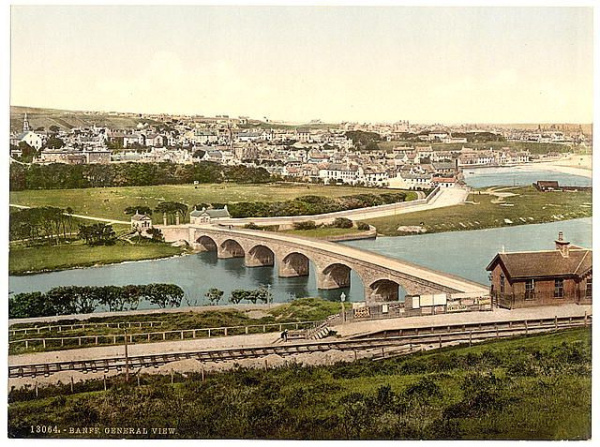 However, there is increasingly an indication that the lighter shade was a dark buff, almost a brown similar to the Caledonian 'Duck's foot'.....see the Photocrom of Banff Bridge station and the restored building at Dufftown below. 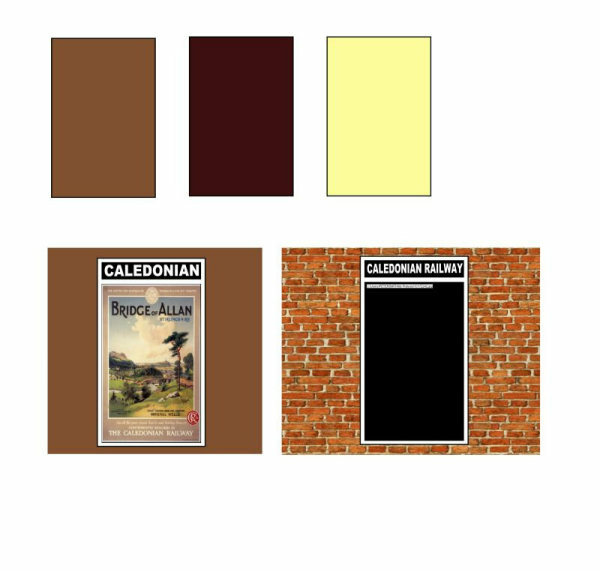 PAINTS FOR THE MODELLER: Precision SR buildings cream & LMS buildings brown would seem to be as good as anything, or for the darker shade use the Caledonian colours. Many thanks to Keith Fenwick for providing the above information. 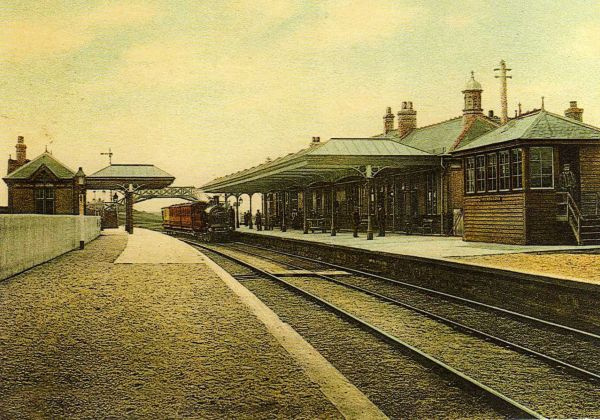 The LMS and LNER naturally used their standard colour schemes on Scottish stations, which have already been described. 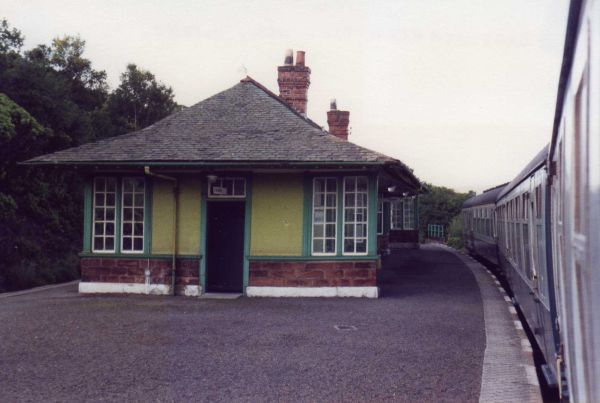 However, Darwin Smith has sugggested to me that LMS stations seem only to have used the post 1936 brown & cream/stone livery, not the red or the green, and this was continued into BR days. 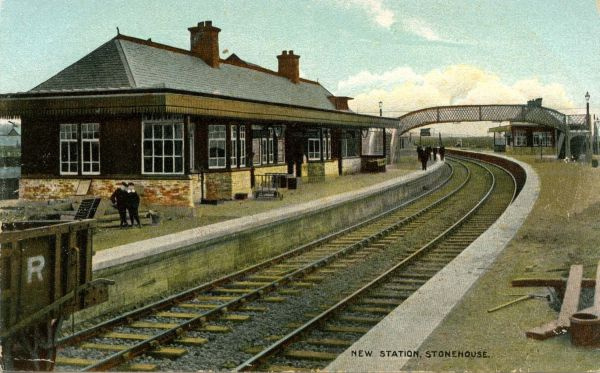 The picture below of the restored station at Redcastle illustrates this colour scheme very well. 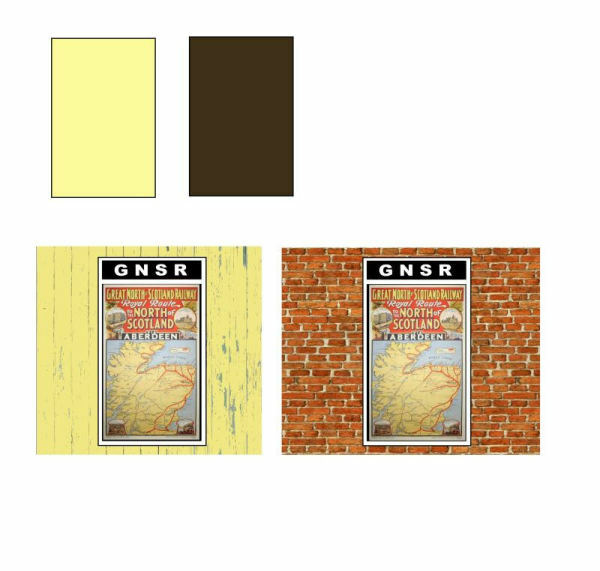 LNER green and cream does not appear to have been widespread in Scotland, unlike in England; all the stations of which I have seen colour pictures are in brown and cream. 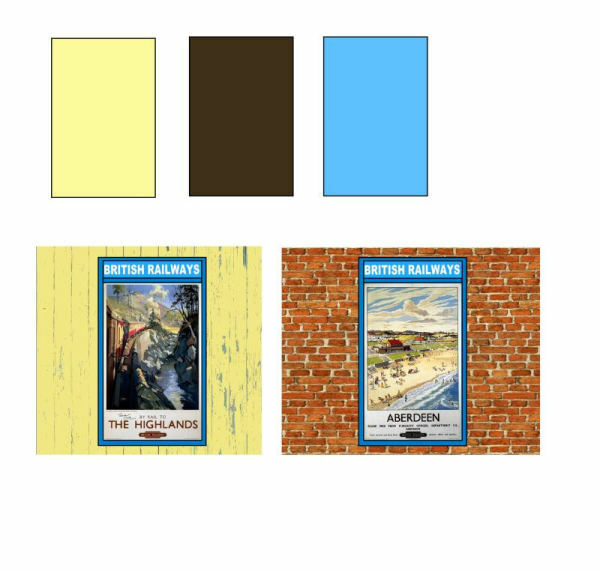 The official regional colour to be used with the cream was an attractive sky blue, not unlike the blue used on some Caley locomotives. However, for some reason this does not seem to have been applied to any buildings, only to the signs & notices. Most buildings seem to have been painted in a brown & cream livery more like the Western Region was using, though in some cases this may have been the LMS/LNER paintwork still surviving. 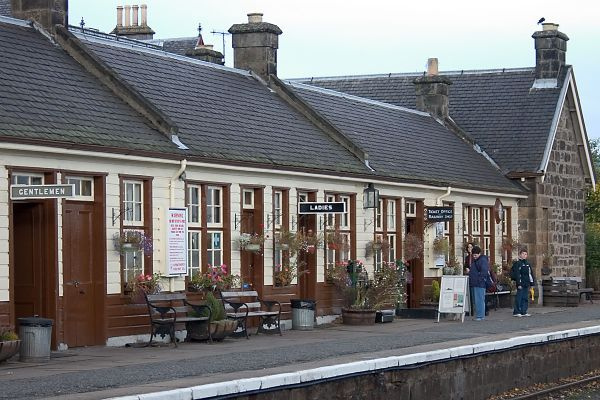 Some buildings were certainly repainted during the BR period, but the brown & cream scheme still seems to have been followed throughout Scotland - perhaps being a long way from London helped! 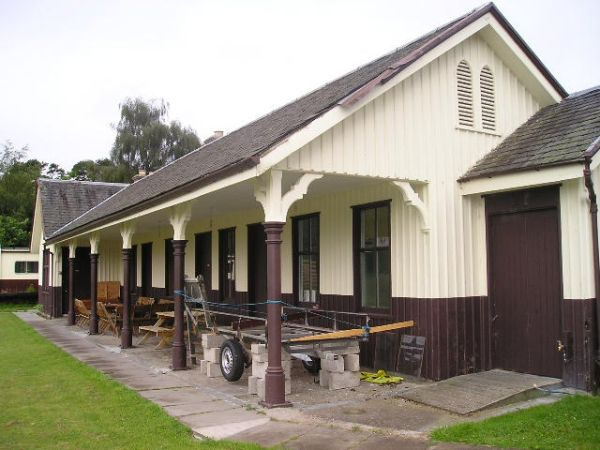 Fairlie station on the Largs branch is recorded as having been in green & cream livery in BR days. The BS381C reference for the regional blue was shade 175 Light French blue.